The Great Barracuda (Sphyraena barracuda) named “Barracoter” (Tag ID: GFR6462) was originally tagged & released by Mate Garrett Frey on December 18th, 2015 while fishing with Captain Daniel Zier and aboard the charter boat Second Nature, out of Key West, Florida. The Barracuda was measured to be 40 inches (101.6 cm) total length and had an approximate weight of 22 pounds. The Barracuda was recaptured 40 days later on January 26th, 2016 by Captain Rafael Carreras aboard the fishing boat La Pinta out of Key West, Florida. The recapture was near the Toppino’s Reef, which is a popular fishing and diving location in the waters off Key West. 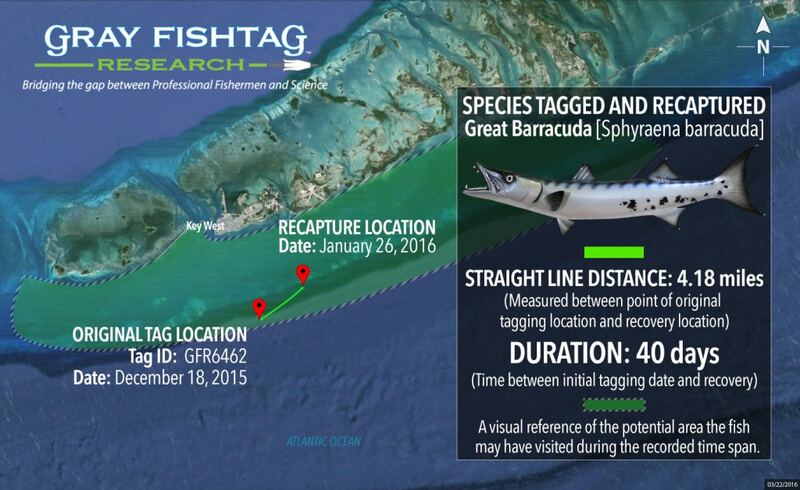 The recapture location was approximately 4.18 miles away from the original tag location. During that 40 day time period, the Barracuda most likely stayed in the waters around Key West. That area is ideal habitat with its near shore abundance of coral reefs, seagrasses and mangroves as well as home to numerous small fish, which is the primary food source for the Barracuda. At the time of recapture, the Barracuda had an estimated length of 42 inches and weight of 24 pounds. Based on the length measurements, this Barracuda was a mature fish. After the tag information was recorded, the Barracuda was harvested for a local fish market. Great Barracuda’s exhibit a brownish to blue/gray on their dorsal side, with silvery sides and a white bottom side. The black spots found on the lower sides of the Greater Barracuda is what distinguishes it from other barracuda species. The Greater Barracuda inhabits both nearshore and offshore waters near the surface. They are often found in waters associated with coral reefs, seagrasses, and mangroves and tend to move offshore as they grow larger in size. The Second Nature charter boat crew will receive some Gray FishTag gear for their tagging efforts. Rafael Carreras will receive a pair of Costa Del Mar sunglasses, a Tag & Recovery Certificate, and Gray FishTag gear for reporting the tag recovery.